In my brief review of the Town of Parry Sound’s Key Performance Objectives earlier this week (link) I conveyed a sense of cynicism with respect to the plan to secure more volunteer contribution through better recognition of their efforts. Recognition is wonderful and admirable, but it’s not enough. How many employees are satisfied with having their name placed on the ‘employee of the month plaque’, but not receive an annual salary increase? A couple of events just this week reinforce my sense of cynicism, and sense that a total rethink of Town services and volunteers needs to be undertaken by Senior Staff and Council, with involvement of the rank, file and volunteers. At this week’s council meeting there was a deputation by a pair of enthusiastic individuals who wanted Council approval to clean up the bottom of the Big Sound beside the Smelter Wharf (aka the Salt Dock). They were prepared to start the project in a couple of weeks and had assembled a team of divers and support people to not only ‘dive for dreck’, but to also cart it away. The presentation was positive and well done. The discussion thereafter quickly devolved into concerns about the Town’s possible liability for any untoward personal or environmental mishaps. It looked as though the project would not be approved. Shortly after the deputation and discussion a pair of Senior Staff members excused themselves and left the room while the other deputations were presented along with the Councillor reports. They returned perhaps ten minutes later with information and analysis that led Council to be confident that the project could go on with limited or insignificant liability concerns. Well done. This is the type of action that shows the Town supports volunteer activity and will work to help make it work. This occurred in the past few days as well and took place at one of the public spaces in Parry Sound. A local volunteer was there picking up garbage that had either been spread around by the gulls, the wind, or careless people. While picking up the garbage a Town of Parry Sound pickup truck drove up with two people on board. One of them hopped out and picked up the garbage bag in the container. At that point the volunteer spoke with the two employees and explained how the volunteer regularly came by to pick up the garbage and would appreciate it if staff would pick up the stuff lying around, not just what was in the garbage bag. At that point the driver reached out his window, tapped the side of the truck, and said, ‘we aren’t Parks and Recreation’. End of discussion as I understand it. Jeez. How’s that for motivating volunteers. The people who are paid to take care of the Town’s interests blow off a reasonable request for attention to detail. Yes, I understand that the summer students who usually handle the garbage have left and Public Works was probably tasked with garbage detail. No, it’s not fun, but I imagine that there are quite a few people who would like these jobs, even if it involves picking up the occasional piece of garbage, not just the garbage bag. Let’s talk about a sliding scale of how I imagine the Director of Public Works would have liked to have seen that play out, from worse to best. Answer: ‘We aren’t Parks & Recreation’. Answer: ‘Thanks for the suggestion’, with no intention of ever getting out to pick up any garbage. Answer: ‘Thanks for the suggestion. We appreciate your efforts to help us keep Parry Sound looking the best it can’, with no intention of ever getting out to pick up garbage. Answer: ‘Thanks for the suggestion’, with an intention to pick up garbage, or ask their partner to pick up loose items as they deal with the garbage container. Answer: ‘Thanks for the suggestion. We appreciate your efforts to help us keep Parry Sound looking the best it can’, with an intention to pick up garbage, or ask their partner to pick up loose items as they deal with the garbage containers. It’s discouraging enough when there are people who vandalize the toilets, pull out flowers, and just drop their garbage. But the Town needs to lead by example if we hope to have residents take pride in their town, and expect volunteers to step up to do much of the ‘dirty work’. Yes, this is a harsh criticism that doesn’t apply to all Staff. It only takes a few underachievers to set an unfavorable image for Town Staff as a whole. Volunteers depend on leadership and example to make their substantial contributions. Perhaps the volunteers aren’t suffering from burnout, perhaps people just think Town Staff and Council really don’t care. Giving out more gold stars won’t do it. Well that’s the kind of enthusiasm Parry Sound can use. Last night’s meeting included four separate deputations and the common theme for three of them was enthusiasm, ideas and the energy to make things happen. It started with a nice tight summary of what the Georgian Bay Biosphere Reserve has been up to and where they are headed. This was followed by a rousing suggestion of building a more vibrant arts community that involves the adaptive reuse of the Old Fire Hall. There was mention of a PS I Love You theme as part of the arts initiative. (A little more on this below.) Not losing any momentum, there was a presentation from the 8-80 committee on getting the Town moving literally and figuratively. All-in-all it was well done and Council seemed to respond positively. We can always use more energy and enthusiasm. The fourth deputation? It was unscheduled and was from a supplier pitching on employee benefits management. They are the current supplier and it seems they may have been underbid by a competitor and are trying to make sure they don’t lose the business. Their revised pitch reduces their cost by about $43,000 (12% reduction) but exposes us to a little more risk. Nothing of note arose in the questions of Staff or the Councillor reports. Here is an update on the key discussions and decisions. Refer to my preview post or the agenda package at the Town’s website for more detail on the actual issues and background material. 4.1 – Letter. Water damage due to construction Wakefield St. FORWARDED to STAFF. 4.2 – Letter. High water levels on Lake Manitouwabing. FORWARDED to STAFF. 5.1, 5.2, 5.3, 5.4 – Deputations. See comments in introduction. 9.1.2 – Direction. Rezoning Application, Waltmar Inc., 2 Oastler Park Drive. WITHDRAWN. Item was apparently withdrawn although no explanation was offered. 9.1.3 – Resolution. Report – Monitoring of Residential Construction. CARRIED. The report was accepted by Council with the additional request that Staff return in two months with a draft by-law defining the obligations of new building projects with respect to water flow management. It appears the town does not want to get involved in ‘refereeing’ these issues but wants to make it clear that new construction requires a consideration of their impact on surface water flow for neighbouring properties. I agree. A formal by-law will make it easier for neighbours to pursue civil recourse if there is a problem. But let’s see what comes back to Council. 9.3.1 – Resolution. Lay Appointments to Boards, Committees and Commissions. CARRIED. 9.4.1 – Resolution. Revised 2015 Budget Schedule. CARRIED. The January 16th meeting was moved back an hour and now starts at 6:00. There will be an opportunity for deputations by members of the community should they wish to provide input to the budget. Yes, you get the chance to make a statement. You can of course send a letter to Council with your comments, requests and suggestions. 9.5.1 – Resolution. Energy Management Plan for the Town of Parry Sound. CARRIED. Remember I made mention that the theme ‘PS I Love You’ was raised as part of the presentation regarding the Old Fire Hall and an expanded local arts scene?? Here’s one of about a couple dozen similarly themed T-shirt designs and logos I worked on earlier this year. 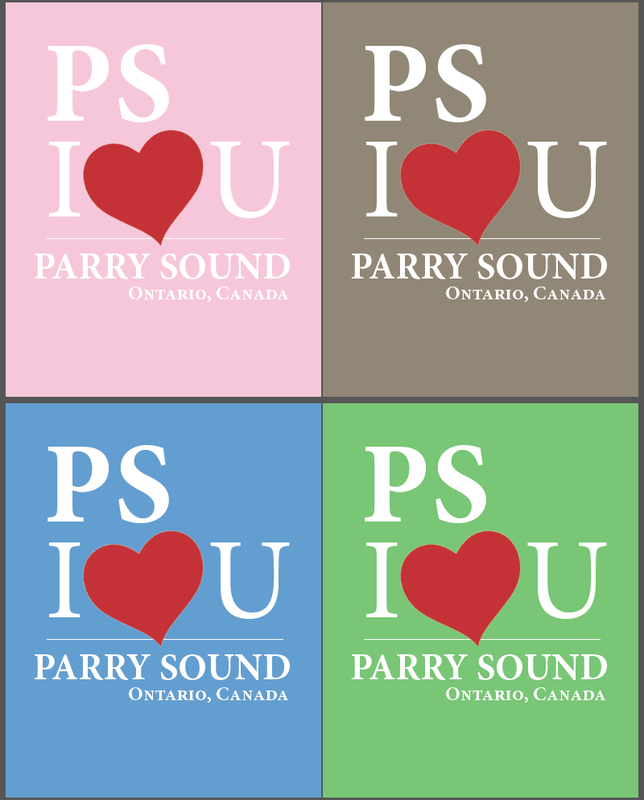 I like the idea of using the I Love Parry Sound theme. Let’s do something with it.